Preston Gralla is filling in for Laura Blackwell, who is on maternity leave. Where do you spend most of your computing life? Probably on a network and online, either at work or at home. But while you probably know quite a bit about how to master problems with applications such as word processors, you may feel out in the cold when it comes to networking. Downloads can help. This month, I've gathered four downloads that will help you take control of your network and of the way you use the Internet. With them, you can set bandwidth limits for individual users on your home network, easily share files with others, master the ping command, and become a networking troubleshooting pro--all without having to go to night school. 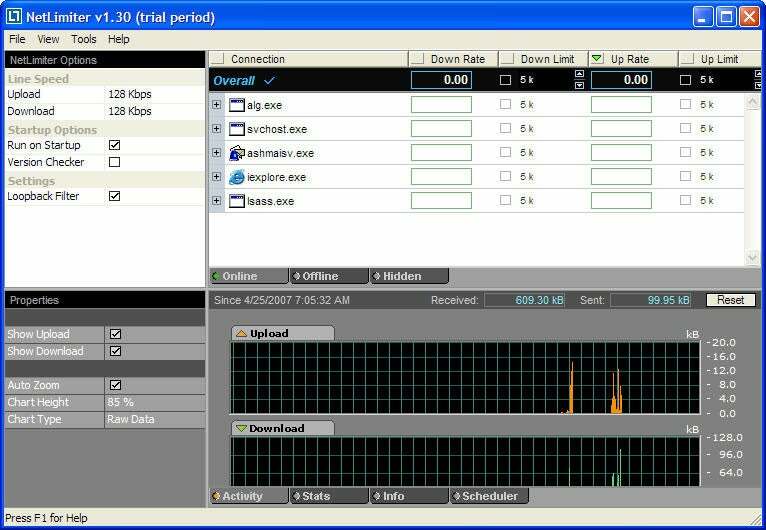 NetLimiter allows you to set bandwidth limits for certain applications, thereby leaving more bandwidth available for others. Here's a familiar problem: You're downloading a very large file--such as an application--on your home network; and while that operation is going on, your Web browsing slows to a crawl. You'd prefer to slow the download and commit most of your bandwidth to your Web browsing. That's exactly what NetLimiter is designed to do. It enables you to specify a maximum amount of bandwidth to devote to certain applications and connections, while letting other applications and users get as much bandwidth as they wish. You can fine-tune these limits to a surprising degree, even setting separate upload and download limits on a per-connection or per-application basis. Aside from letting you allocate bandwidth limits, the program does a fine job of monitoring your network use and showing you current upload and download usage, bandwidth usage over time, and the like. Be aware, however, that NetLimiter doesn't work properly with Windows Vista, though its developer says that a Vista-compatible version is in the works. NetLimiter is free to try for 28 days; it costs $30 to register. Torrent Swapper makes it easy to share files using the BitTorrent protocol. File-sharing software has developed a bad reputation over the years, in part because so much of it comes riddled with adware or spyware. To make matters worse, many file-sharing programs put little effort into helping you find particular files--and when you do find them, downloads can take a long time. That's why, when it comes to sharing files, your best bet these days is software that uses the BitTorrent protocol. With BitTorrent, you download bits and pieces of each file from multiple locations, which speeds up the process. But while the BitTorrent protocol is quite useful, the BitTorrent client is less so. Instead of relying on it, try Torrent Swapper. This free, open-source software is superb at helping you find the files you want, and then downloading them. You can start and stop downloads, change the priority of files on your download list, set download speeds, and much more. Where this program really shines, though, is in its social networking features. It allows you to download files that friends and acquaintances have downloaded--just press a button, and you'll see the list. In addition, you can recommend files to others and rate files. If you've given up on file sharing because the process was too painful, try it again; with Torrent Swapper it might seem worthwhile again. If you run a firewall on your PC, it may ask you whether it should permit Torrent Swapper to access the Internet. Be sure to give your approval; otherwise, the program won't work. Network Magic helps you manage your home or small-office network. Like it or not, running a home network turns you into a network administrator. If something needs troubleshooting or setup, you have to take care of it. Enter Network Magic. This excellent network utility assists you with many common--and uncommon--network chores. Wizards walk you through tasks such as adding a new device to the network, fixing a broken network connection, sharing a printer or folder, and setting up wireless protection and encryption. The software digs far deeper than you might imagine. For example, it scrutinizes every PC connected to your network and reports on the state of its security--such as whether automatic updates are available. It draws a map of your network and all of the devices on it, and provides detailed looks at each device. It reports on your network activity, too, including details about when devices connect. You also get a bandwidth tester for measuring your current Internet broadband speed. Network Magic is available in both free and for-pay versions. 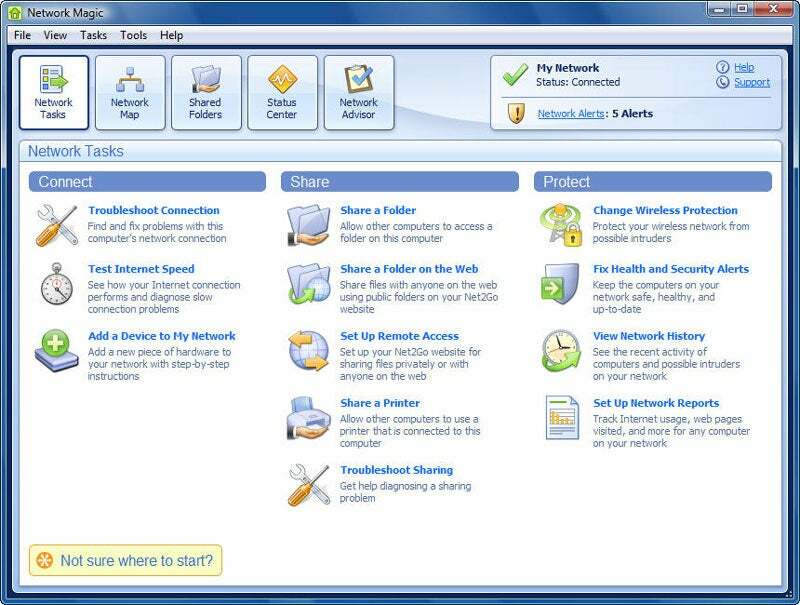 The free version includes most of the features you'll need, such as repairing broken connections, issuing security alerts, and monitoring network activity. The paid version, which costs between $24 and $40 (depending on the number of PCs on your network), delivers daily reports of Internet activity, supports remote access to your network's files, and includes other advanced features. As is the case with Torrent Swapper, you may have to instruct your firewall to permit the program to connect to the Internet so that it can work. 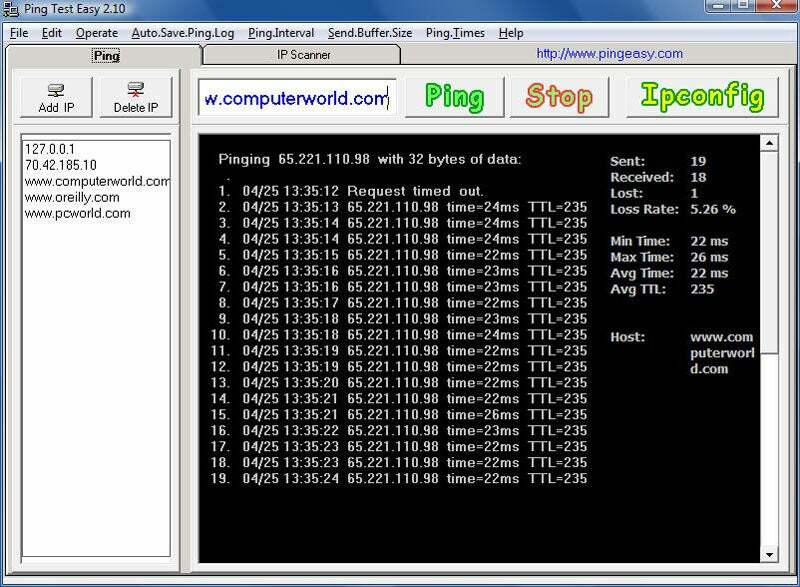 Ping Test Easy simplifies the task of checking Web sites and servers to see whether they are online. If you're feeling techie, perhaps it's time to give Ping Test Easy a try. This freebie automates use and configuration of the network ping command, which tests whether a particular computer, server, or Web site is connected to the Internet and working. The command also provides other information, such as how long the site took to respond to you and how many packets were lost en route. Without Ping Test Easy, issuing a ping command involves just going to a command prompt, typing ping, and pressing <Enter>. So why would you need this program? In the first place, it maintains a list of sites that you either have pinged or want to ping. In addition, it lets you configure ping in many different ways--by changing the amount of data sent via ping, for example, or the ping interval. And if you need a record for some reason, it will save your results to a log file. Will this software change your life? Certainly not. But it does simplify a monotonous task, and it's free. In my book, that makes it a bargain.